So your dog has a Meat Tooth and not a sweet tooth? Do they love, beef, liver, chicken or buffalo? Maybe they love all meats? We have a treat to hit the spot! Tummy spot that is! A classic dog cracker, with a twisted name, these little nuggets are made with free-range chicken breast! Dogs go CRAZY for the smell of our fresh Liver Bits! OH NO, they're POD PEOPLE! We need your dog's help to rid the world of these delicious Pod People. Gluten-Free, Corn Free, Wheat Free, low-fat and all organic.. could this be the perfect dog treat? 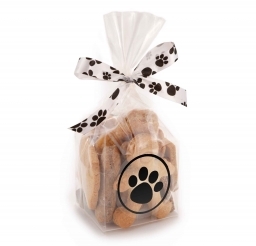 These ultimate party bags with assorted flavors are pure pooch delight. Hand made in small batches using only human quality all-natural Grade A Eye-of-Round. The ultimate dog party mix! Each bag is pure pooch delight, filled with four dog-favorite flavors.